You might think that sitting down too much is the last thing a mum with young children needs to worry about, but if you’re working at home on a computer — running a website, for instance — the sitting can add up. And that’s a problem when evidence is stacking up that, as HR Magazine reports, “Sitting for long periods of time can result in greater risk of type two diabetes and cardiovascular illnesses”. Prompted by this evidence, office workers worldwide are taking to standing desks, especially in Scandinavia, where 80% stand to work for at least part of the day. Although the uptake in the UK has been more cautious, numbers are regularly growing as workers start to feel the health benefits and employers start to notice improvements in productivity. This is nothing new. 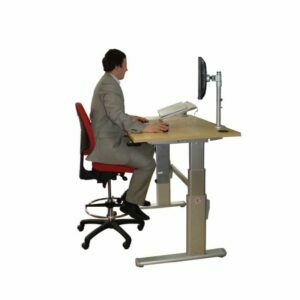 Past advocates of standing to work include Winston Churchill and Ernest Hemingway, but now there are standing desks operated electrically to make them fully adjustable to whatever height you need, and you can find a reasonably priced electric standing desk at Back2.co.uk. Although too much sitting is bad for your health, that doesn’t mean that standing all the time is ideal. As the Guardian puts it, “There should be options in the workplace so that everyone can stand, sit, walk” and this is equally true when working from home. 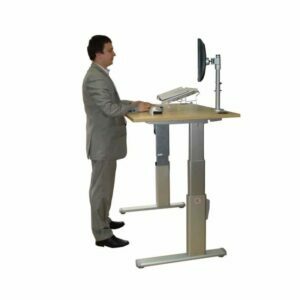 Fortunately, having electrically adjustable desks means that they can be designed to allow either standing or sitting, depending on the needs of the moment. Some tasks, such as typing a new blog, are better done sitting while jobs such as checking through emails can be done standing up. The benefits of sit-stand desks are being recognised far beyond the office environment. Many people who work from home, including mumtrepreneurs, are adopting them since prices have now come down far enough that they’re within anyone’s reach. A number of studies have also been made of the effects of children standing for part of their time at school. As Reuters reports, these generally seem to suggest that standing desks can benefit children, and even if your children’s school doesn’t adopt the idea, child-sized sit-stand desks are available for them to use at home. If you’re running a business from home to benefit your children, you also owe it to them, as well as yourself, to safeguard your health. Why not check out whether a standing desk or a sit-stand desk would suit you?